We look forward to welcoming back organist Simon Gregory. 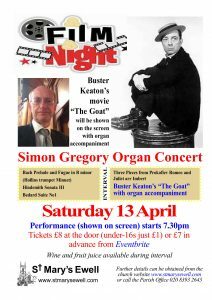 “The Goat” starring Buster Keaton- with live organ accompaniment. All proceeds will go to the Arthur Mathews Organ Fund in aid of the Willis Organ at St. Mary’s. Refreshments are served during the interval. Information about tickets etc is here.